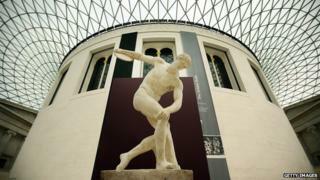 The British Museum in London - complete with all of its exhibits - is to be recreated in the video game Minecraft. The project is part of the Museum of the Future scheme, which aims to expand the institution's appeal. Many real-life organisations have created maps in the Minecraft universe, including Ordnance Survey and the Danish government, who aim to make young people more aware of their work. Last week, Minecraft was sold to Microsoft for $2.5bn (£1.5bn). A spokeswoman for the museum emphasised that the project was still at "an early planning stage", and the "build" had not yet begun. She added that the organisation was intending to recruit members of the public to help with the "construction". One British Museum employee posted details of the project on the social media site Reddit, asking for volunteers to get involved. He received an enthusiastic response from Minecraft fans around the globe. The first step of the process will involve digitally creating the Great Court and facade of the building. The institution hopes this stage will be ready in time for a public debate entitled Changing public dialogues with museum collections in the digital age, taking place on 16 October. Ed Barton, who researches gaming for the analytics firm Ovum, told the BBC the British Museum's move to Minecraft would help it be "perceived as something fun", and would serve as an effective educational tool among a younger demographic. "It's the digital equivalent of building the British Museum in Lego," he said. "You have to build it brick by brick". He added that the institution was to be commended for crowdsourcing the project, "as it turns it into a collaborative thing" and could further engage young Minecraft enthusiasts. "What a cool project it would be to be asked to build the Elgin Marbles in Minecraft," he said. Those interested in contributing to the British Museum's project can register their interest on Reddit.